Chelsea manager Antonio Conte said his side showed they have the "attitude to fight" as they scored two late goals to come from behind and claim a dramatic victory against Watford at Stamford Bridge. 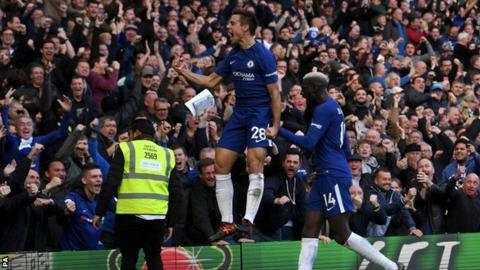 Cesar Azpilicueta headed the Blues 3-2 in front in the 87th minute before Michy Batshuayi sealed the victory in stoppage time, ending a three-game winless run despite an unconvincing performance from the champions. It was Batshuayi's second of the game after he had headed an equaliser midway through the second half, his side having fallen behind to Watford goals either side of half-time to hint at a third consecutive Premier League defeat for the Blues. Pedro put the home side ahead in the 12th minute with a sensational 25-yard strike that curled away from Watford goalkeeper Heurelho Gomes and in off the right-hand post. But the Blues were shaky defensively throughout and Marco Silva's Hornets scored twice through Abdoulaye Doucoure and Roberto Pereyra to put them on course for a famous victory. It could have been even worse for Antonio Conte's side as Brazilian Richarlison missed two glorious chances for Watford - one from six yards out, the other a close-range header - either side of Pereyra's goal. But Batshuayi's equaliser and the third for Azpilicueta saw Conte throw himself into the home crowd as his side completed a turnaround that the Belgium striker then capped deep into injury time. Chelsea have not lost three consecutive games since 2015 under Jose Mourinho, a month before he was sacked. Asked how he felt when his side were 2-1 behind, Conte said: "I feel a lot of pressure but not this pressure if the club decide to sack me. I will never be worried [about getting the sack], never. I don't worry about this pressure because this is the job." Victory takes Chelsea above Watford into fourth in the table. After a relentless run to Premier League glory last season, Chelsea's early defence of the title has been anything but smooth, with defeats to Manchester City and Crystal Palace in their last two games. Reports this week suggested Chelsea's players were unhappy with Conte's punishing training regime following their Champions League draw with Roma and modest league form. The Blues looked to be settled by Pedro's spectacular opener but as Watford grew into the game the Chelsea defence, so impressive last season, began to look porous. They failed to deal with a long throw for Doucoure's equaliser and Pereyra was then left unmarked for Watford's second as the Hornets cut them open with worrying ease. Yet credit must go to Chelsea for the way they responded to going behind. Batshuayi scored his first 10 minutes after coming on as a substitute to make it 2-2 and the mood at Stamford Bridge changed markedly when Azpilicueta completed the turn around. On the back of their two league defeats and Champions League draw with Roma, it was a win that felt extremely significant for Conte and his side in terms of the whole season. "It is not simple because we are facing difficult situations but the spirit and commitment is right. I'm satisfied for the performance," Conte said. Certainly their spirit and drive was in marked contrast to the sort of surrender witnessed in the season - that saw Mourinho sacked - that followed their last title triumph. Watford started the game unbeaten away from home in the Premier League this season and fourth in the table, one place above Chelsea. Their performance was deeply impressive for the most part, combining athleticism and energy with plenty of technical ability. The marking for Batshuayi and Azpilicueta's headers for Chelsea's second and third goals was poor but what cost them equally as dearly was the finishing of Richarlison. First, the Brazilian missed an open goal from six yards after Kiko Femenía's superb cross and then he headed horribly wide from a similar distance when unmarked. Manager Silva labelled the result "unfair" and complimented Richarlison despite his profligacy - but the Portuguese will know that had the forward been less wasteful in front of goal, his side would have given Chelsea an even bigger hill to climb. "It [the result] didn't reflect the match and what we saw on the pitch," Silva said. "Our team came here and controlled most of the match." "I'm proud of how we played, but of course I'm really frustrated. It showed our way and we need to continue in this way." Did Silva move cost Hornets? BBC Sport pundit Phil Neville on Match of the Day: "The game changed I think because of a substitution. Watford dominated the game and they were creating chances. Silva brought Deeney off and put Ben Watson on, an extra midfielder. "All of a sudden the mentality changed. They sat back and allowed Chelsea to get control of the game." Chelsea manager Antonio Conte, speaking to Sky Sports: "The performance was good because to concede the equaliser at the end of the first and then go down in first part of the second half, our confidence in that moment was low. "But my players showed me we have the attitude to fight and change the situation and get a different result. It was very important." Watford manager Marco Silva, speaking to Sky Sports: "It is a really unfair result. We didn't create many chances in the first half, it is true, but we controlled the game and Chelsea started to play on the counter attack. "We played our game and in the second half for 40 minutes there was only one team playing on the pitch. After 2-1 we had clear chances to finish the match. He may have only been on the pitch a little over 30 minutes but the introduction of Michy Batshuayi was crucial to Chelsea's turnaround. He headed the equaliser - from a cross by another man of the match contender, Pedro - when Chelsea were really struggling for momentum and then capped the victory with a determined effort in the closing minute to ensure no late equaliser from the visitors. Chelsea are unbeaten in their last 13 meetings with Watford in all competitions, winning 10 and drawing three. Watford have conceded exactly four goals on each of their last three top-flight trips to London (0-4 v Tottenham, 3-4 v Chelsea and 2-4 v Chelsea today). Pedro has been directly involved in more goals for Chelsea in all competitions in 2017 than any other player (21 - 12 goals, nine assists). Eden Hazard registered his first Premier League assist in 15 appearances in the competition (since April 2017 v Crystal Palace). Abdoulaye Doucouré has scored with all four of his shots on target in the Premier League this season. Richarlison (five) has had a hand in more goals than any other Watford player in the Premier League this season (three goals, two assists). Michy Batshuayi has scored in each of his three Premier League appearances against Watford (four goals in total). Cesar Azpilicueta has been directly involved in more PL goals than any other defender this season (five - one goal, four assists). Chelsea are in EFL Cup action on Wednesday when they host Everton at Stamford Bridge (19:45 BST) in the fourth round. They return to Premier League action on Saturday when they travel to Bournemouth (17:30). Watford's next game is at home to Stoke in the league on Saturday (15:00 BST). Match ends, Chelsea 4, Watford 2. Second Half ends, Chelsea 4, Watford 2. Goal! Chelsea 4, Watford 2. Michy Batshuayi (Chelsea) right footed shot from the centre of the box to the centre of the goal. Assisted by Tiemoué Bakayoko with a headed pass. Offside, Watford. Abdoulaye Doucouré tries a through ball, but Richarlison is caught offside. Offside, Chelsea. Cesc Fàbregas tries a through ball, but Michy Batshuayi is caught offside. Substitution, Watford. Andre Gray replaces Adrian Mariappa. Corner, Chelsea. Conceded by Christian Kabasele. Goal! Chelsea 3, Watford 2. César Azpilicueta (Chelsea) header from very close range to the bottom left corner. Substitution, Chelsea. Davide Zappacosta replaces Pedro. Attempt missed. Christian Kabasele (Watford) header from the centre of the box misses to the left. Assisted by Kiko Femenía with a cross. Attempt missed. Michy Batshuayi (Chelsea) right footed shot from the centre of the box is too high. Assisted by Cesc Fàbregas following a set piece situation. Substitution, Watford. Ben Watson replaces Troy Deeney. Attempt missed. Michy Batshuayi (Chelsea) right footed shot from outside the box is close, but misses to the right. Assisted by Cesc Fàbregas. Kiko Femenía (Watford) is shown the yellow card. Corner, Watford. Conceded by Cesc Fàbregas. Attempt saved. Christian Kabasele (Watford) header from the centre of the box is saved in the centre of the goal. Assisted by Tom Cleverley. Goal! Chelsea 2, Watford 2. Michy Batshuayi (Chelsea) header from the centre of the box to the bottom left corner. Assisted by Pedro with a cross following a set piece situation. Substitution, Chelsea. Willian replaces Marcos Alonso. Corner, Watford. Conceded by Antonio Rüdiger. Attempt blocked. Richarlison (Watford) right footed shot from the right side of the six yard box is blocked. Assisted by André Carrillo.